One of the Aeolian Islands in the Tyrrhenian Sea off the coast of Sicily, Stromboli is only three-miles wide and has a population of fewer than 500 people. The remoteness of the island has left it largely untouched by modern life. With no roads, the two villages on the island are accessible to each other only by boat. The larger village, Stromboli, offers a black-sand beach and hikes up the volcanic mountain that takes up the majority of the island. Scientists say the volcano has been in a constant state of activity for over 2000 years, with minor eruptions occurring every 1 to 2 hours. One can see the glow of the volcanic eruptions against the night sky. Ginostra, a small former fishing village, is home to the smallest port in Europe, with room for only one boat. 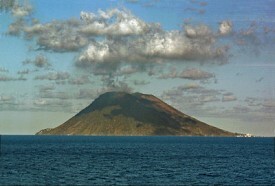 The island was the location for the 1950 film Stromboli, starring Ingrid Bergman, and the red painted house featured in the film remains a popular tourist attraction.